I have always thought that when a car company advertises a certain model, the primary intention is to sell as many units of that model as possible. It had never occurred to me that a given model might be promoted for marketing purposes other than the goal of necessarily selling that model. "Loss leaders"?-- that is for the local pharmacy; "bait and switch"--that is for the local supermarket. Surely neither of these marketing ploys could have any relevance for the marketing and promotion of an automobile brand.My, oh my -- was I wrong! Consider the following two items that appeared in separate December 2011 issues of The Economist. In the first article ("Difference Engine: Volt farce") here, which appeared in the 8 December issue, the focus is on the challenge facing GM in dealing with questions over the safety of the electric battery, the technological centerpiece of the highly touted Volt electric car here. "For General Motors, a good deal of the company’s recovery from its brush with bankruptcy is riding on the Chevrolet Volt (Opel or Vauxhall Ampera in Europe), its plug-in hybrid electric vehicle launched a year ago. Not that GM expects the sleek four-seater to be a cash cow. Indeed, the car company loses money on every one it makes. But the $41,000 (before tax breaks) Chevy Volt is a “halo” car designed to show the world what GM is capable of, and to lure customers into dealers’ showrooms—to marvel at the vehicle’s ingenious technology and its fuel economy of 60 miles per gallon (3.9litres/100km)—and then to drive off in one or other of GM’s bread-and-butter models." Stated otherwise, the "Volt" brand is being promoted no less for the broader message that the brand is intended to convey about the technological capabilities of a reborn General Motors than for the the direct sales potential of the model (at least for the foreseeable future, which remains uncertain). While the Volt is not exactly a loss-leader, I am sure that GM wants to make a lot of money on this vehicle, if for no other reason than the costs of bringing a new car model to market. Still, the current tribulations of the Volt car point to the fact that GE cannot really allow customer perception of the vehicle as a symbol of the company's technological prowess, even if the model itself is not directly contributing to the company's bottom line. But this is hardly the first time that an automobile model has been used to serve purposes other than the direct sale of the model in question. This was brought home in the article in the 17/24 December issue of the same magazine ("Retail Therapy: How Ernest Dichter, an acolyte of Sigmund Freund, revolutionised marketing") here. Dichter, while today largely forgotten, was a seminal figure in the marketing revolution that took place in the 1930s and 1940s, where the focus was how to exploit irrational purchasing behaviour for better sales performance. Dichter was a committed student of Freud, and his focus was on the Freudian preoccupations of the day, emphasizing the emotional, the irrational and the sexual. 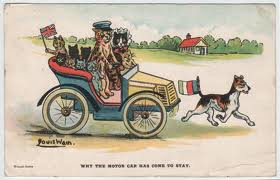 In this context, perhaps Dichter's most creative marketing ploy was his approach to the then new line of Plymouth cars. The problem was that sales of the Plymouth brand were lagging. Dichter reasoned that the problem could be found in the slogan--""different from any other one you have ever tried." Dichter reasoned that the slogan triggered an unconscious fear of the unknown in purchasers. The solution that he fashioned was ingenious. Dichter gleaned from interviews that, while only 2% of car purchasers (in 1939) owned a convertible, they (especially middle-aged men) almost all dreamed of owning one. And so the ploy. The male would be drawn into the showroom to look at the convertible--a symbol of "youth, freedom and the secret wish for a mistress". He would then return with his wife, who had no interest in sharing her husband with a mistress, even of the four-wheeled variety. The compromise was the purchase of a sensible sedan -- of the Plymouth variety of course. It was a clever scheme to leverage one model to encourage the purchase of another. It would be overstated to suggest that the Volt is a "loss leader" in the traditional sense, or that the Plymouth convertible was a "bait and switch" tactic. Still, there are tantalizing points of similarity. In the auto industry as well,the interrelationship among the mark, the brand and the product are at once both more and less than that which meets the eye.